In this second and final part of our look at voltage, we explore what an electric potential actually is and how a voltage (potential difference) can be created. • When measuring a voltage, the two voltmeter leads are placed ‘across’ the voltage; that is, to measure the difference in potential between two places the voltmeter leads are attached to these two places. This second and final part of the article explores what an electric potential actually is and how a voltage (potential difference) can be created. 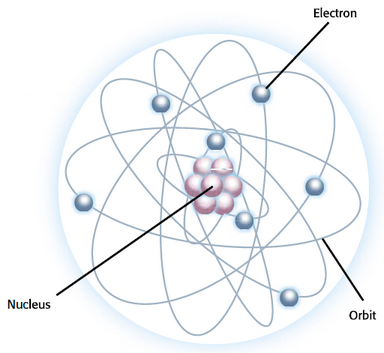 You probably know the simple model of an atom that describes it as a positively charged nucleus (centre) surrounded by negatively charged electrons. Overall a complete atom is uncharged because the charge on the nucleus is exactly balanced by the charges on the electrons. However, if an electron is removed from an atom, it – and the material it is a part of – becomes positively charged. In the same way, the object that holds the removed electron will become negatively charged. There is now a difference in electric charge between the two items. This difference in electric charge creates a potential difference, or voltage. The size of the voltage is directly proportional to the size of the charge difference. The charge on a electron is tiny, so to create a useful voltage a very large number of charges have to be separated. and 1C is the charge equivalent to about 6×1018 electrons. properties of the material between the charges.